Yes, it's the return of Casual Friday's. It's been awhile and I've finally tripped across a Friday where I don't have 13 other things to do. Today there's just 4 or 5 other projects I should be working on. 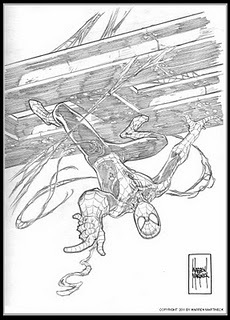 I have a short list of requests for Casual Friday's and this Spider-man is the first one from it. And to answer another question, no... at this point none of these Friday Drawings are for sale. Sorry. Well, I've recently finished up the Inks over Mike Lilly on that oversized Antony & Cleopatra Graphic Novel and have seen some of the colored pages which look awesome. (Nice job Wilson) Among another little unmentionable job I had to fit in, I've finally caught up on a big chunk of work. But before starting my next job, which is already a few weeks beyond my intended starting date, I needed to get a good studio cleaning (next post) and one last commission I've had on my list that I'd intended for late summer. So here it is, a little late but it always feels so good to get these done. 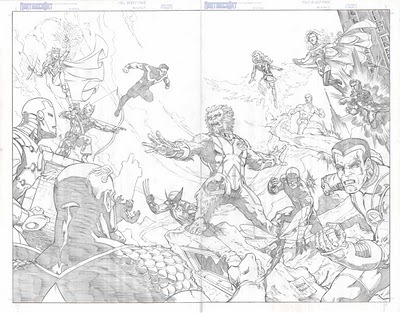 By request: X-Men vs Avengers, in pencil. I had a few minutes to get to a couple of pieces from a long list of artwork I've been meaning to get to for awhile. These are pics of a D&D type Battle/Mages' main weapon/staff. It's a chain whip that can be "lit up" with Lightning type spells.